Cinecultist:What's Going On With Those Fezes? What's Going On With Those Fezes? They were the first indie band to have videos on the fledgling MTV. They came up in the performance art scene in the East Village. They wrote the music to the opening of The Daily Show on Comedy Central, as well as a theme for the Austin Powers movie and Malcolm in the Middle (okay, I knew about Malcolm but not the others). They play a huge stick with a mic on it in their live show (had heard the song, but guess I didn't see this stick at the shows I've attended). They graced the cover of Paper magazine back in the day and had their first major review in People magazine before they'd even released their first full album. 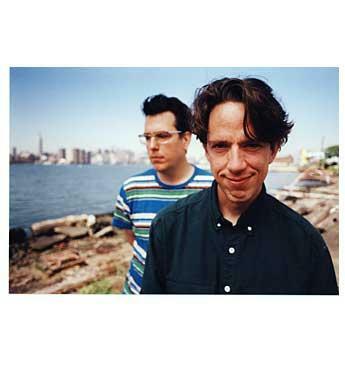 Very cool people are fans of TMBG like Sarah Vowell, Ira Glass from NPR, Harry Shearer, Andy Richter, Jon Stewart, Michael McKean and they appear in the docu. Gigantic is the best kind of music documentary in that it gives you information, behind the scenes access and a feel for what it's like to be at a show. Flansburgh and Linnell are wacky guys and it's a real testiment to their dedication to music and their prodigious talents that they've stayed so vital for so many years. The docu also made me desperate to see them live again, which I plan to on June 8 at Joe's Pub in the city. Yeah, TMBG! You've let loose the birdhouse in my soul. Again.